We recently worked with a very prominent attorney who for years said that he didn’t need a website and if anybody wanted to see anything about him, they could just Google his name and see all the results. This all changed when we finally received a call from the client saying that he now wanted a website. When we asked him why he changed his mind, he had indicated that the night before he was at a dinner party with a major celebrity who had not retained his services. When asked, the celebrity indicated that he did not choose our client because he did not have a website and he was impressed with the other attorney referrals that did. Most attorneys look at legal marketing expenses as what they gain by taking action. This includes building up referral networks of other attorneys and formal clients, advertising on TV, radio, in print publications, directories, etc. This also includes the visibility you can receive (or not receive) through the use of a legal website. In 2009, the ABA Journal found that 65% of people indicated that they now start their search for an attorney online. But what is important to note is that attorney searches also begin at the point of referral. Since most attorneys give out referrals in numbers (which most malpractice insurance coverage companies encourage), people are increasingly looking up and researching their referred attorneys online BEFORE they decide to contact them. Without a website that you can control, you as an attorney are at the mercy of the alternative websites and directories that will ultimately end of controlling your image online for you. If you don’t have a optimized website (or no website at all), try Googling your name and look at the results. These will likely include attorney directories, ratings agencies like AVVO, news, press releases, case summaries, etc. You may even see Google Places listings with customer feedback (positive & negative) about you. Even though you may not be aware of these things, your clients and referral clients are. In most cases, you have little or no control over these sources of information about you – especially if you don’t have a plan to manage them online. Does this attorney have the experience and expertise to handle my case? What results has this attorney received for other clients and does he/she have a solid track record? How much will this attorney end up costing me and what value do I get in return? Because of these questions, it is little wonder why I typically see web pages dealing with results and/or testimonials at the top 5 most trafficked pages on a good attorney website. Make sure your website is fully optimized for attorney searches. Go on Google and type in your name along with lawyer and/or attorney and your location and see what comes up in the search results. If your profile on your website is not ranked #1 for this search, you need to contact a legal SEO consultant to help change this for you. It important to point out that the #1 ranking in Google gets 36.4% of the clicks on the first page so your goal should always be to achieve that position. If you don’t have a website today, get one now – waiting will only make things worse for you. Design your website to appear more professional than your competition. Studies have shown that most people will make a decision on the quality of a website within less than a second. In short, you have a very short window to impress your referral clients online BEFORE they decide to let your competition do the same. 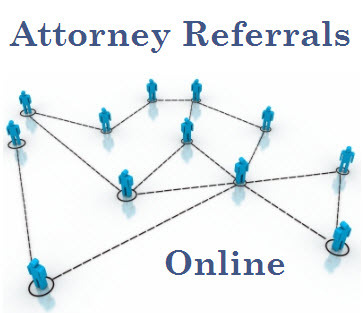 If you know who are commonly provided as other attorney referrals along with you, take a look at their websites and see how you stack up. If you are unclear of your competition, simply ask your referral clients on a regular basis and take note of who else is commonly mentioned to them. Utilize social media with an active content strategy. Since most attorneys get business from client referrals, what are you doing to actively keep you in their minds? Marketing experts agree that you need to be in front of people 7-12 times a year for them to actively remember you WHEN THEY NEED YOU. One of the best ways to do this is to create an active content strategy so they will see you on a consistent basis when they are on Facebook, LinkedIn and/or Twitter. Claim and optimize your Google Places Listing. If you have no idea what I just said, then once again you should rely on a legal marketing expert to help you at this point. This is critically important when people do searches for you by name and also include where you are located in the same search. Google will make this connection and in many cases, will propel their Google Places listings at or near the top on the results. Once claimed and optimized, these must then be monitored, controlled, and improved upon by encourage customer testimonials and removing or displacing any negative comments as well. Try to edit any third party attorney profiles that appear on the first page of Google. Some of these like AVVO will allow you to claim and edit for free while other sources such as Martindale may require a fee to claim and modify these listings and/or to make them more comprehensive and complete. Promote positive third party search results to higher positions on the first page of Google. Do any of the search results involve newspaper and/or TV articles about major case wins? How about positive press about an award you may have received or something else that positively reflects on you? Through the use of targeted inbound link building, you can actually help promote and improve these search results by creating targeted citations from other web properties. Remove and/or diminish any negative results or articles dealing with you. If somebody has said something negative about you in a blog, in a news article and/or other content sources, you may have little recourse to have it removed if any of that information may be factually correct. If you cannot have them removed, you next best option is to simply diminish their visibility by promoting other positive web sources to appear above them. In short, you can push down bad results by promoting positive results above them. Again, this involves targeted link building strategies which a good legal SEO consultant can help you with. Thanks for the post! Very interesting! Thanks again! If you want to learn how to tighten skin check out the site below.